Mrs. Donalin, The Island School music teacher and program director. Accepted students were divided into two groups, Allegro and Legato, with a total of 14 students in both groups. 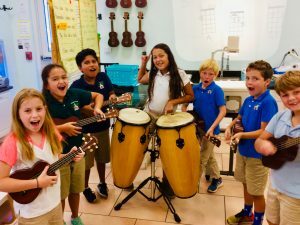 One of the students accepted in the program, Edwin Garcia, said: “It’s a fun program that is very exciting.” The students will have the opportunity to play the ukulele, drums of all kinds and other instruments this year. Edwin said that the ukulele was “easy to learn and fun to create music with.” The students have been learning chords (musical notes combined), playing the different instruments and songwriting. The students will also practice using and hearing their voice/singing in a microphone. Mrs. Donalin is planning a student performance sometime in the spring. The performance date and time will be announced soon. Mark your calendars for the spring and look forward to seeing and hearing some great musical performances by our up- and-coming island musicians. Hope to see you there!